The Canon Powershot A1000 IS is a well-made, compact digital camera, with an understated but stylish silver and blue plastic body and excellent overall finish. It's easily small enough to fit into the palm of your hand, quite an achievement considering the 4x optical zoom lens that's equivalent to a 35-140mm focal length. The A1000 IS has also been considerably slimmed down, measuring less than 3cms thick when turned off, making it suited to either a trouser pocket or small camera bag. It weighs 155g without the battery or memory card fitted. As with most Canon cameras that we have reviewed before, the Powershot A1000 IS is one of the better models around in terms of build quality. Every aspect has a quality feel with nothing feeling flimsy or ill-thought out. The main criticism that we leveled at previous PowerShots, namely that the tripod mount was plastic instead of metal and positioned in the extreme left corner of the bottom of the camera, has now been partly rectified by the A1000's central, but still plastic mount. The battery compartment houses the memory card slot though, which means that the AA batteries sometimes fall out when changing the memory card as they don't have a catch to keep them in place. Still, this is a fairly minor cricitism of a quality product. A less welcome change is the removal of any kind of hand-grip. Previous models were comfortable to hold thanks to the chunky, rubberised hand-grip, but this has been completely removed on the A1000 and inexplicably replaced by a smooth finish embossed with the Canon logo. Thankfully, and unlike the more expensive A2000 model, the A1000 does have a noticeable, rounded bulge on its right-hand side, which goes some way to helping with grip. The various buttons are well-made and easy to operate, with the slippy mode dial of the A2000 replaced by one with a much more positive action, and the camera feels well-balanced in your hands. There are no real innovative features here, but everything that the Canon Powershot A1000 IS does, it does extremely well. 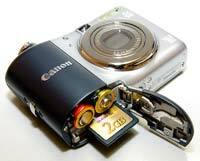 Overall the Canon Powershot A1000 IS is well constructed and designed with no obvious signs of corners being cut. The Canon Powershot A1000 IS has relatively few external controls, just 11 in total, which reflects the fact that this is quite a simple camera in functionality terms, with only limited photographic control on offer. Located on top of the A1000 IS are the Power button, Mode Dial, Zoom Lever and Shutter button, and on the bottom are the tripod mount and battery compartment, which also houses the SD memory card slot. On the rear of the A1000 is the 2.5 inch LCD screen, and a number of controls to the right. You can directly access the various focus and flash options by clicking left and right on the navigation pad, whilst up and down are respectively used to set the ISO speed and burst/continuous shoots modes. There is sadly no longer a dedicated button for exposure compensation, which is a commonly used feature, although you can work around this by optionally setting the Print Transfer button to one of 7 available options (which include exposure compensation). The Function/Set button in the middle of the navigation pad opens a sub-menu, which allows you to set exposure compensation, white balance, image effects, metering and image size/quality settings. This system is a good compromise given the size of the camera and therefore the limited space for external controls. All 11 external controls are clearly labeled using industry-standard symbols and terminology. Overall the camera body feels very well-designed and not at all cluttered. The 2.5inch LCD screen has a wide viewing angle from left to right, and is visible in all but the brightest of sunlit conditions. A small optical viewfinder is also included, which is welcome for moments when it is difficult to use the LCD screen. I found it to be a little on the small side, however, so you will probably find yourself using the LCD screen most of the time. If you have never used a digital camera before, or you're upgrading from a more basic model, reading the comprehensive and fairly easy-to-follow manual before you start is a good idea. Unfortunately Canon have chosen to cut costs and only supply the full manual as a PDF on a CD, rather than in printed format (there's just a short printed guide to the camera's basic features). Not much use if you're taking pictures and need to find out what a particular option does. The menu system on the Canon Powershot A1000 IS is extremely straight-forward to use and is accessed by a dedicated button underneath the navigation pad. Quite a lot of the camera's main settings, such as white balance, exposure compensation and ISO speed, are accessed elsewhere, so the main menu system isn't actually that complicated. A row of 2 icons along the top of the LCD screen represents the Camera and Setup sub-menus, with most of the options being the kind that you set once and then forget about. Due to the very large and bright LCD screen, the various options are easy to access and use, especially as only 6 are shown onscreen at one time. The Canon Powershot A1000 IS offers Program, full Auto and a comprehensive range of different scene modes aimed at the user who just wants to point and shoot, making this camera particularly well-suited to the beginner. There's also the new Easy Mode, where the camera automatically sets every shooting setting, preventing the inexperienced user from changing anything at all, apart from turning the flash on and off. This mode really does turn the A1000 into a true point and shoot camera, perfect for use by children for example. The Canon Powershot A1000 IS has an anti-shake system, dubbed IS Mode - turn it on in the menu system and the A1000 IS automatically compensates for camera shake, which is a slight blurring of the image that typically occurs at slow shutter speeds. There are three different modes. Continuous is on all the time including image composition, Shooting is only on when you press the shutter button, and Panning as the name suggests is best when using the camera to track a moving subject. In practice I found that it does make a noticeable difference, as shown in the examples on the Image Quality page. You don't notice that the camera is actually doing anything different when anti-shake is turned on, just that you can use slower shutter speeds than normal and still take sharp photos. Leaving the anti-shake system on all the time does seem to affect the battery-life, however, with the camera only managing just over 200 shots before the supplied LR6-AA Alkaline batteries ran out of power. As part of a belt and braces approach, the anti-shake system is also newly backed up by motion detection technology that assesses camera or subject movement. The latter is effectively what rivals would refer to as digital anti shake, as, activated in high ISO auto mode, it boosts ISO to a level (between ISO80-800) it considers will compensate without hopefully introducing too much noise. Still, you do get both in the same camera. The start-up time from turning the Canon Powershot A1000 IS on to being ready to take a photo is quite quick at around 1.5 seconds, and it takes about 3 seconds to zoom from the widest focal length to the longest. Focusing is very quick in good light and the camera happily achieves focus indoors or in low-light situations, helped by a powerful focus-assist lamp. The visibility and refresh rate of the 2.5 inch LCD screen are perfectly acceptable, although the low resolution of 115,000 pixels does produce a noticeably grainy image display. It takes about 0.5 second to store an image, allowing you to keep shooting as they are being recorded onto the memory card - there is a very quick LCD blackout between each image. In Continuous mode the camera takes 1.3 frames per second at the highest image quality, which is slow for this class of camera, although the shooting rate is maintained until your memory card is full. The flash recycle time has been improved from previous A-series PowerShot models, now taking about 3 seconds to recharge between shots. 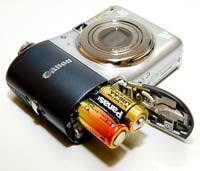 All in all the Canon Powershot A1000 IS is quick in terms of operational speed. Once you have captured a photo, the Canon Powershot A1000 IS has a pretty good range of options when it comes to playing, reviewing and managing your images. You can scroll through the images that you have taken (although there's an annoying delay), view up to 9 thumbnails, zoom in and out up to 10x magnification, view slideshows, delete, protect, resize and rotate an image. You can also add a sound clip to an image, assign a category, set the print order and the transfer order. The Red-eye Correction options fixes red eye after you have taken a photo (useful if you forgot to activate it before). The Display button toggles detailed settings information about each picture on and off, such as the ISO rating and white balance, and there is a small histogram available during playback which is helpful in evaluating the exposure. A thrids press of the Display button shows the image alongside a small, magnified section, useful for quickly checking the sharpness. In summary the Canon Powershot A1000 IS is a stylish, compact and well-built digital camera that is particularly suited to the beginner snap-shooter. PhotographyBLOG is a member of the DIWA organisation. Our test results for the Canon PowerShot A1000 IS have been submitted to DIWA for comparison with test results for different samples of the same camera model supplied by other DIWA member sites.